This has been a brutal couple of weeks for those with white skin. It started with a three-ring circus at the University of Missouri, another landmark in the slow death of white America. And it drew to a close with the actual deaths of scores of French citizens. The circus at the University of Missouri began after campus groups started protesting what they claimed was bad treatment of “minorities” on campus and an indifferent response to their complaints. The black student-government president, Payton Head, whined on Facebook that someone called him the N-word from a passing pickup truck. A few days before the school’s homecoming parade, members of the Legions of Black Collegians claimed that some unidentified person shouted racial slurs at them. No names, no evidence, no actual harm – just petty accusations. Angry black students blocked university system President Tom Wolfe’s car at the homecoming parade in a bizarre attempt to get his attention. When he wouldn’t get out of the car to chat with them, they were offended! Student government President Head later posted that Wolfe “smiled and laughed” during the protest. “He laughed in our faces. This is your president. This is America. 2015.” What a dummy. Then the football team threatened not to play. And the white coach, Gary Pinkel, went along with them. Pinkel apparently values appeasement, and the money big-college football brings over what’s right. So President Wolfe did what all self-respecting white liberal males do – he caved, and resigned. Not surprisingly, a black man, Michael Middleton, was named the system’s interim president. 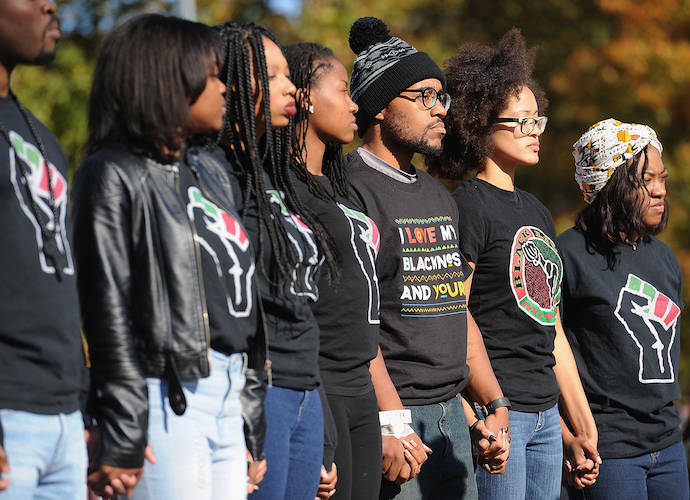 The whole Missouri University circus is about the redistribution of power and wealth – from white to black. It’s about taking away from white decent people and giving to godless blacks who have not earned their way. The white football coach, Pinkel, announced he was resigning at the end of the season for “health” reasons. The chancellor, Bowen Loftin, announced he, too, was quitting at the end of the year. The University of Missouri will never be the same now. Weak, liberal whites have created monsters in their schools. The monsters are now eating them, and threatening to eat others. By Thursday, chaos reigned across the country as students protested their schools and called for heads to roll. The situation will not get better until white Americans put an end to it. In fact, it will only get worse. Speaking of “getting worse,” the New York Daily News reported that two black teenagers (13 and 14-year-olds) allegedly killed a white woman in her car, and then went on a joyride with her dead body propped up in the front seat. No, you won’t see this story on the evening news (at least not with the races mentioned). And with clear evidence that white Americans are standing by as their country is going down in flames, Friday evening we heard news of the Paris attacks and concert hall massacre of mostly white French by Muslim terrorists. Somewhere along the way, whites in Europe and America have lost their connection to God and have decided to give up defending their communities and freedoms. Europe has been in the process of handing their continent over to Muslims. And white Americans are handing over their country to black malcontents – and Muslims. Friday it was reported that the first wave of Syrian immigrants had arrived in New Orleans. Where was Louisiana Gov. Bobby Jindal to stop this? Where are the protests from outraged Americans? If you stand up against the bullies – whether they’re radical black bullies on campuses, or Islamic bullies, they will go sit down. But if you act with fear, they will run over you and your children. You can’t prove anything to angry people. You just have to speak up, be honest and live your life. Telling the truth and setting a living example is the only way to change anything for the better. The greatest civilizations in the world are being destroyed by the godless. The godless have not been raised by decent parents. They’re looking for love in all the wrong places, and in the wrong way. And now they’re destroying the free world. It’s time for whites in America, and in Europe, to stop the madness. If it isn’t stopped, your way of life – and possibly your life itself – will be stopped.